Pioneers in the industry, we offer epoxy compound from India. 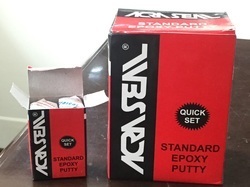 Acraseal Epoxy Putty is 2 pack conventional putty used for primarily water proofing sealing leakages from cracks developed in concrete or metals. Excellant filler in CASTINGS and in WOODEN FURNITURE manufacturing.Avaialble in 3 pac sizes: 1Kg, 100g & 20g with MRP of Rs280/- , Rs30/- & Rs10/- per pc respectively which are inclusive of GST. Looking for Epoxy Compound ?